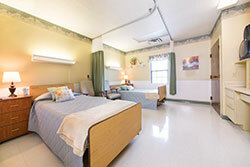 Atkins Nursing and Rehab offers modern conveniences in a family friendly setting. We feature a hair salon, a reading library, lush outdoor secured courtyards with a putting green, a large projection TV screen and a spacious common area for visitation. 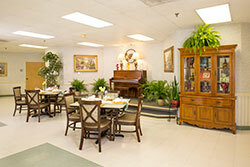 We offer laundry services, mail delivery, daily housekeeping services, and transportation for our residents. 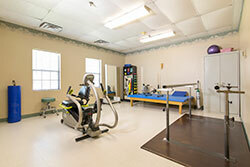 Atkins Nursing and Rehab offers modern conveniences in a family-friendly setting. As you walk in the front door you will feel a comfortable atmosphere hopefully different than any other facility you have visited. We provide daily planned activities led by Certified Activity Directors, like social events and outings and pastoral services with spiritual care for all religions. We strongly encourage family participation in group activities, meals and celebrating family birthdays and special days. To help you plan your visits we provide a monthly event calendar and a monthly meal planner.